I caught RNC Chairman Michael Steele at two speaking events on Saturday and I couldn’t help but think what should have been. Steele nodded in agreement when I said that his Blueprint document from his campaign for chair was the forgotten outline for their success. In other words, they could be winning on facts, policy, and positive candidates rather than fear and loathing. He got off the bus with the GOP candidate in Macon and smile as if to say “where did you’ll find this one.” Austin Scott is a policy wonk and the type candidate (like Scott Brown) who centrists could take in swing districts. Before the event started, I told someone that I was the most important person there. The guy said wouldn’t that be the person with the news camera. My humorous point was that I was from the center and the last month of the election is about getting our votes—not preaching to the choir by getting the same votes of the same people you had on day one. 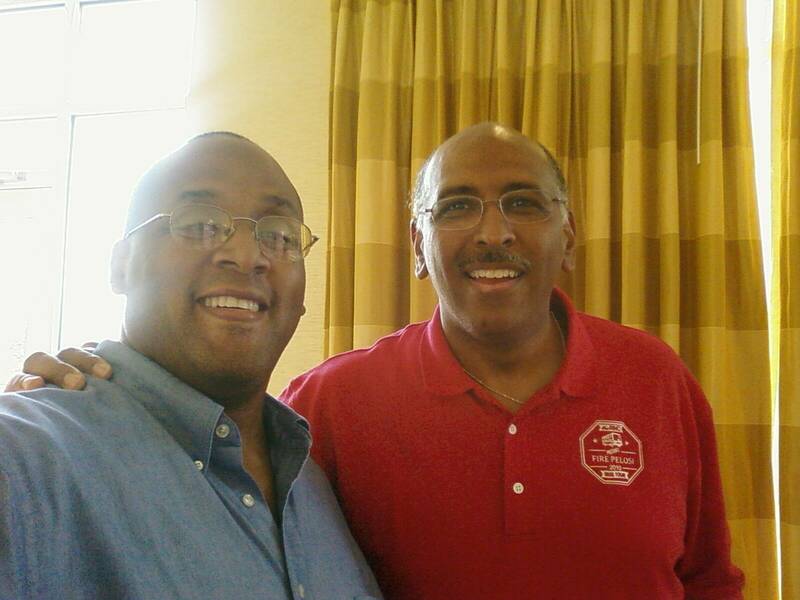 Michael Steele brought the gift in Macon, Georgia, and reminded me why so many Blacks in Maryland supported him for U.S. Senate. He represents a version of conservatism that is palatable in our community. The guy spoke without being angry and some in the crowd seems to be hearing their views presented with sugar for the first time and grasp the concept. In Statesboro, Georgia, later that day, I was talking with Steele’s staff photographer in the lobby of a hotel as we watch a college football game. Again, I said Steele really should be in the Senate and he agreed that his old friend was in his element when connecting with the people. I have known Ray McKinney, the GOP candidate from the 12th congressional district, for years and he could win the center from a Blue Dog if he pulls blue-collar labor voters. For example, the story was told at the event of a pallet of campaign materials arriving and the warehouse personnel looking for a forklift driver. As a nuclear power plant worker, Ray knows equipment and jump on the forklift himself without second thought. McKinney isn’t a country club Republican. We Democrats accept flexible candidates in swing districts because the other voters in the area need to have their voices heard also and policy might have elements of their concerns. South conservatives traditionally have a “my way or the highway” “winner take all” mentality. I think that isn’t a healthy way to run a diverse nation and my friends and I will support GOPers like Steele, Scott and McKinney who add range to the game. Steele will be in my congressional district this coming week but I won’t be there. My community likes our Blue Dog just fine–thank you very much. Slyram, if I didn’t have commitments, I would have joined you. I have heard Michael Steele speak twice. Once in DC several years ago and the other time in Georgia. His message was similar and very much like what you have described. Too bad he doesn’t seem to be resonating enough to his fellow Republicans, constituents, elected officials and candidates. Here in Georgia and throughout the U.S. It’s about time for our Unlikely Allies book Tour. For those who have not purchased my book yet, you can get it at http://www.hbagroup-intl.com. A must read for such a time as this. Charles Krauthammer’s piece in my local paper brilliantly pointed out that Bill Buckley (I assume he is talking about William F. Buckley) had a rule: Support the most conservative candidate who is electable. If I have said it once, I have said it a thousand time; you got to produce primary candidates that can win in November. That’s why Blacks have been patient for so long with Blue Dogs. They are the Democrats who can win in those middle to conservative districts. When the Right doesn’t to not show the same flex (as Steele would have engineered), they are proving Krathammer’s point. Slyram, leave it to you to see the silver lining. Michael Steele could have been a game changer and super star maker but instead one can only wonder “what could have been”. Once again he and Obama have something in common, it is not very likely to be another of either in their respective positions for centuries to come. Their gameday came and the sun will soon set and it is abundantly clear their visions were not met. As they used to say in my granddad’s barber shop when one of his barbers were done, “next gentlemen, next”. Mr. Murphy: You are right and I just wanted to point out that if that party would have listened to Steele and people we know, they would have candidates better suited for particular districts. General Colin Powell did a fine job of making this point on Meet the Press yesterday and the future home of moderates on that side of the political fence is up in the air. I will say they are uncomfortable because the far right is louder this election season but the center still has great numbers. is fundamental and all. But think about if you added some great images or video clips to give your posts more, “pop”!